I’ve been in the loft today to bring down the Christmas decorations and the Crib. The crib was always an important part of our Christmas, an important thing for our children. It tells a story of a joyful occasion when God sent his Son to be one of us. Now we have grandchildren the story is still important in our house. I think it was a smart move on God’s part to send us Jesus as a baby rather than an adult. Who could fail to welcome a new baby? The arrival of an adult would not produce the same feelings of joy as a new baby. Of course this was no ordinary baby. This was the Christ child, come as the saviour of mankind. This was the child come to give us a future, an eternity with God. The Crib is full of symbolism. Jesus is born in a stable with an animal feeding trough for a bed. God sends His Son to us in poverty. His first visitors are the poor shepherds, alerted by an angelic choir. This birth has been foretold by prophets. A sign in the sky, a star, guides three kings on their search for the holy child. These kings or wise men pay homage to the child; thus the child is king of kings. The gifts of gold, frankincense and myrrh are potent symbols of the kingly and divine nature of the child and the medical properties of myrrh attest to a violent end. The symbolism of the Crib prepares us for the role Jesus is to play in our salvation. There is a dark side to the story. King Herod decides to kill the child out of jealousy. He doesn’t want another king to usurp his place. This is the first rejection of God’s salvation and it is played out in the violence of the massacre of the innocents. Loving parents, Mary and Joseph abandon everything and take the child into exile in Egypt. Jesus starts life as a refugee. For children this is a lovely story. They sing “Little donkey” and imagine Joseph leading the donkey with Mary and the holy child on its back. They think of Mary cuddling the child close as the donkey takes the strain. The reality must have been a bit more stressful than that. I’s a nice image for a child but I’m not a child anymore; though my wife might suggest that my behaviour sometimes belies that fact. While I might enjoy playing hide and seek with my grandchildren I must force myself to take an adult view of the journey into Egypt. The holy refugee family must have experienced the fear of being caught and must have worried about their uncertain future. This Christmas there are many families in that same part of the world experiencing the same worries and fears. The flight of refugees from danger in Syria and African countries is now a crisis that even threatens Europe. Thousands have dies in the Mediterranean, drowned in a vain attempt to reach a new, safe life. I find it hard to understand why people would put their children’s lives at such risk. That’s because my grandchildren are living in a safe, loving environment. King Herod’s role has been taken over by others who are jealous of their role and status in the world. People with real power; people who should know better are bombing and shelling more children that Herod ever killed. How can I hope to understand the fear that drives refugees to journey to a Europe where nobody is trying to kill you? Sadly, those who are successful find themselves in a continent where children are not as safe as they assumed. It seems like every day that we hear stories of children being abused in the Church, in schools, in sports activities and even in the BBC. We hear that abuse has been going on for decades and we wonder what kind of place this is. It seems like those in authority have shamefully neglected their responsibilities to children. I’m part of the Safeguarding team in our parish. The Church is now facing up to reality and putting in place a structure to defend the vulnerable. It’s high time the rest of society was doing the same. But surely we must do more than that. Surely we must change the culture of abuse in our society. If abuse of children and the vulnerable was tolerated by those in authority it can only reflect the attitude to people in general. If we refuse to value the lives of people, be they children, the poor, the old or those with special needs then abuse of these can be seen to be acceptable. It is only when we value all human life, even the unborn, that we will begin to stamp out abuse. When a political opponent makes a good argument we can rubbish it by pointing out they have a physical deformity or they breed salamanders or some other thing that makes them less than us. If they are less than us we can abuse them and that’s ok. But that’s a dishonest argument and distorts our political life. If we want truthful debate and live in a society where truth is a guiding principle (this seems to be an old fashioned idea today) then we must accept and promote the truth that all people are of equal value. So what to give the children for Christmas? It could be the latest big thing. It could be Star Wars, that’s big again. It could be Batman, Iron Man and the rest of the gang; my three year old grandsons are avid followers of them. These will fade away in their turn to be replaced with a new big thing for next Christmas. The compelling thing about these superheroes is that they fight for justice. They step in to defend the people where governments fail. I wonder if that’s what attracts children to them. They appeal to a child’s natural sense of justice. Perhaps that’s what we should be hoping to give our children for Christmas. Do we need to become the superheroes of our age? Can we defend those people society abuses? Perhaps we should be more vocal about the injustice of attacking the unemployed, describing them as scroungers and cutting the benefits paid to the poor. Should we be asking questions of our parliamentary representatives about how we deal with those refugees who are seeking a safer existence for their children? Now you might ask if that’s not asking the Church to become political. That’s a good point and some politicians have suggested we should keep our noses out of politics and stick to Sundays in church. But we are part of the Universal Church. The Church is for everyone in the world. We are all part of Christ’s family and have responsibilities for each other. Imagine a world where every person is valued. Dare to hope for a world where everyone has the right be live in safety. I think that would be a wonderful Christmas present for my grandsons. I can’t go out to a shop and buy it. There is no online store that can deliver it. I could start slowly. I could begin with me and see if I can change my ways to make me more open to the people who are not like me and begin to see them as just as valuable as me. That’s my road to superherodom (I just invented that word) this Christmas, what about you? My December column should appear in this weekend’s Scottish Catholic Observer. I thought I’d be topical and write about Christmas. What does Christmas mean to you? What is the Christmas message and who is it for? What are you getting from Santa? Full text here next week, all going well. November is the month when we usually focus on remembering the dead. As a nation we have just been commemorating the deaths of the military in two world wars and numerous smaller conflicts. As usual this brings about sharp debate about wearing the poppy. Woe betide the T.V. personality who fails to display the poppy on screen. It was extended this year to condemn the puppet that did wear a poppy. It seems public display is the order of the day. For Catholics this is a month of prayer for the dead. We compile our November lists and our deceased relatives and friends can be formally remembered in masses each day. The uninformed observer might ask why we bother as the deceased are, of course, dead. The answer is that we know they are dead but they are not gone. In God’s eyes we are all one. Death is merely a step out of this life into the next. As a wee boy I learned that we are praying for the dead that they might get into Heaven. It’s comforting for us to know that those we love are still there. 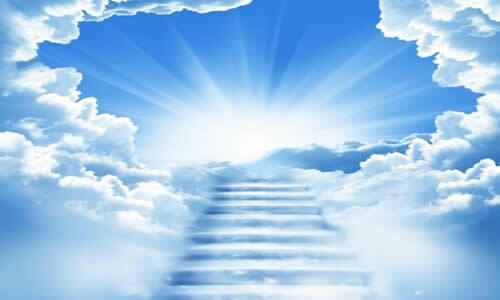 I’ve always hoped and imagined that they are really in Heaven already. That brings me to the thorny question of Heaven. What or where is Heaven and what is it like? This question came to the fore in our parish recently when our Parish Priest tried to clarify our ideas of Heaven. He pointed out that despite the fact that we often point upwards to Heaven; there is no evidence of any trace of Heaven up there. He told us not to think of Heaven as a place. It was quickly reported and repeated throughout the town that the priest had said there was no Heaven. It’s a lesson I learned many years ago, be careful what you say because some people will hear something quite different. Thinking that there is no Heaven is a serious matter. If there is life after death there must be somewhere to live and that is Heaven. Jesus promised us Heaven when he told the Apostles that his Father’s house has many mansions. The idea of mansions colours our image of heaven. It is easy for us to imagine an eternal life of luxury. This would be our reward for living a good life. This is where my doubts arise. My doubts are on two levels. Firstly I wonder just what we can expect in Heaven. The Church has taught that we will be resurrected in our bodies glorified and imperishable. This is the reason for the recent statements about cremation and how we should treat the remains. If we will have bodies in Heaven there must be a place for those bodies. So where is Heaven? Now I must come clean and confess that I don’t know the answer. I suspect that nobody knows the answer. Nevertheless it is a question that seems to bother us. I satisfy my own curiosity with the thought that we have a two state existence. We are flesh and blood and we are also spirit. After death my spirit will leave my body. I will still exist in my spirit. My spirit doesn’t need a place to exist. At the last day, when time comes to an end, the world will be recreated and our bodies recreated in glorified form. Now that might not be completely accurate. It lets me move on, though, to another question. That’s the question of why is the nature of Heaven so important to us. We have the idea of Heaven being the reward for our good behaviour. There are lots of stories about how our Heaven will be determined by our earthly behaviour. I remember the story of the priest who was ushered in through the pearly gates (now where did that idea come from?) and was led past a large mansion. “Is this my place?” he asked. “No, you are further along. That one belongs to a Glasgow taxi driver.” came Saint Peter’s reply. They came to a small hut and the priest was given the key. He was not too pleased. “Why does a taxi driver get a mansion and I only get a hut? I’ve led hundreds of people to God.” He asked. Saint Peter replied that by his wild driving the taxi driver had caused thousands to pray every time he went out on the road. Thus he was due a greater reward. If we try to be good simply to gain a reward are we really living by Christ’s teaching? Think about your children. One child is obedient to the parent for love of the parent. The other child obeys in order to get a chocolate bar. Which is the good child? What’s so good about shaping our behaviour to gain a reward? This reveals a great error in our understanding. In reality we are not able to earn a place in Heaven. We can get to Heaven by Christ’s sacrifice for us and by God’s infinite mercy. If we try to live a good life we are choosing to follow Christ. That reflects the desire to share our eternal life with Him. In rejecting Christ’s teaching we are choosing not to spend our eternity with Him. We can only condemn ourselves. There is the story of the priest giving a mission who tells the congregation to put their hands up if they want to go to Heaven. They all do. He then tells them to keep their hand up if they want to go tonight. The hands go down. Apparently we all want Heaven but not yet. The reason is, of course, that we need to die before we get there. Dying is a step into the unknown. Nobody we know has been back to tell us it’s ok so we are understandably apprehensive. The bishops of England and Wales have recognised this problem and I read in the Catholic Herald that they have done something about it. They have launched an Instagram page which offers advice on dying well. Pictures of those who have died can be uploaded and a network of five convents and abbeys in England will offer prayers for the dead and dying people. There is a website which complements this work. You can find it here. As we get older (let’s face it nobody is getting younger) the prospect of death and its inevitability loom larger. The T.V. adverts encourage us to prepare for that time. We can take out a life assurance policy so that our family will have money to bury us with some ceremony. We are urged to take out a pre-paid burial plan so that we can rest in the assurance we have somewhere to go. These are all very well. It is good to prepare for the future. There are no adverts reminding us to prepare for the real event in our death. After all we will not be around for the funeral. We will be too busy meeting our Maker. Can we prepare for this interview? Just like any job interview we need to revise our life experience. How have we demonstrated our suitability? We have the opportunity to fill in any gaps in our experience of Christian living and get on better speaking terms with God. We know the questions He will ask. “When did you feed me when I was hungry, clothe me when I was naked, give me a drink when I was thirsty? We all know the questions and perhaps we will have time to prepare some suitable answers.